THIS DRESS WILL NOT BE PRODUCED AS MOST OF YOU VOTED IT OUT. A petite fit and flare dress with scalloped V-neckline, 3/4 length sleeves with turn up cuffs in a contrast orange which can be worn up or down. In a heavy draped poly-viscose fabric, this dress is fastened at the back with a concealed zip. COMMENTS : Don't like the neckline and contrast colour. I would prefer a round neck and shorter sleeves. COMMENTS : Don't like the neck, contrast edging - for a more corporate image neck to be a straight V. Edging straight possibly darker shade of the dress. COMMENTS : I'm voting it out because I feel the volume of fabric in the skirt would swamp a petite figure. I like a V-neck and the scalloping is an interesting feature. However, the overall design is not something I would consider wearing. 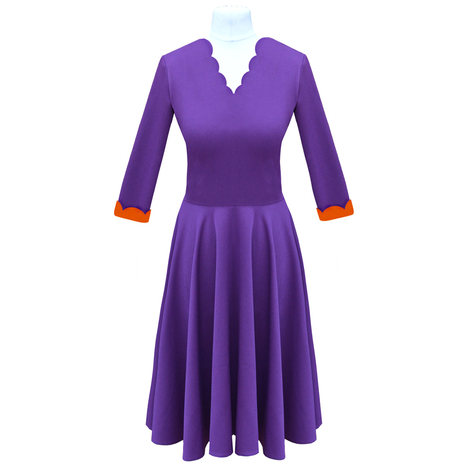 COMMENTS : Voted In because I love the colour and unique cut edge of the neckline but I would prefer a round neck with the edging and sleeves long in purple, not turn ups! COMMENTS : This one is unique for me and it can be a good corporate attire. COMMENTS : Herr are my suggestions: - Keep the scallop neckline - Get rid of the color contrast sleeve ends. - Either shorten the sleeves to above elbows or lenghtem all the way to your wrists. - Lift the waist part a little, to give petites the illusion of having long legs. - Change the lower part completely, by removing the exess fabric/ruffles. Make it clean cut either a slight A-line or figure hugging. - Change the color completely. COMMENTS : I love the color and the neckline is nice too. COMMENTS : The design looks elegant and comfortable. COMMENTS : This dress is so lovely and I totally agree that its uniqueness made it more awesome!